﻿ Promises Today » Blog Archive » Happy New Year! 1. God will love you forever! 2. God will never leave you! 3. God will comfort you! 4. God will help you! 5. God is always faithful! 6. God will keep you safe! 7. God keeps His promises! WOW! I can count on 2012 containing the following things – God’s love, God’s presence, God’s comfort, God’s help, God’s faithfulness, God’s safety and certainty that he will keep his promises. Awesome! With regards to my health, I’ve been doing really well. My periods are still not what they should be, but I’ve received great advice from my oncologist Dr Shah (I adore that man!). He said that Tamoxifen is likely just playing around with my cycles and that once I finish the course of Tamoxifen (I have just under 4 years to go) then all will likely return to normal. So he has suggested that any ablation or hormone treatment will not be necessary. I will need to continue to see my gyno, as they will need to keep an eye on the build up of lining. Just in case… I’m ok with that. I have peace now. I’m not worried. 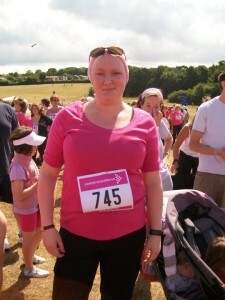 I’m planning on running in the Race for Life in June/July in St. Albans. I weighed myself this morning and I found that I didn’t put too much weight on over Christmas, but my weight it still way too high. So, now begins a new healthier lifestyle! Enough procrastination! I’m going to start swimming again (I really miss it actually), walking more, dancing more (I got Just Dance 3 for Christmas – woohoo! ), perhaps running (Djerk would like to see me try anyway) and eating healthier. I’m not going to “diet”. I hate that word. I know my weaknesses, I know my habits. God, I give it to you right now. Help me to fight through my habits and laziness. I am going to be fitter by the summer. I am going to lose some of this excess weight. My last Race for Life was the summer of 2010. I ran 5km in 57 minutes. Not bad for someone who had just finished chemotherapy for breast cancer huh?! I’m also very excited about our new community group at Bethany. Djerk and I will be leading a group, which has multiplied from Matt and Robyn’s group. We are starting with around 10 people! Crazy times! Bethany is growing so fast, I love it! We’ve had some great prophecies over Djerk and I, acceleration being one of them. Woohoo! Bring it on! So, that’s me. I will try and blog a little more often, for those interested (is there anyone out there reading this?!) and let you know how I get on. For now, I hope your 2012 is looking as exciting and hopeful as mine. I love your fighting spirit. And What a super reminder of all the promises we have in Christ which are Yes and Amen!! Have a great year ahead ! Wow what can I say, you are amazing, a real inspiration to all of us. Really loved the blog. When ever my faith may start to lapse I will be truly inspired by your strenght and faith. You are an amazing person and friend. We will pray for you and the family.